Hey hey hey! I've been itching to write this post for a while now because I have big news— I got into a clinic! In case you didn't know, a clinic is a class where you get to handle real cases on your own. It's great because you're getting real experience (great to mention on resumés or in interviews) but you still have a professor to help you out. Because I transferred I missed the deadlines to try to write on a journal so I was really excited to apply for a clinic since I feel like I'm not as involved as I should be. At my school, you can be in a clinic your 2L or 3L year so I did miss the opportunity to do it my 2L year but I'm still really stoked to get in to a clinic. Btw if you're a 0L I highly suggest you look into the clinic opportunities when considering a school. At the beginning of the Spring semester, they announced that applications were open for the clinics in the daily school email (so if you're not reading those, maybe ya should be). 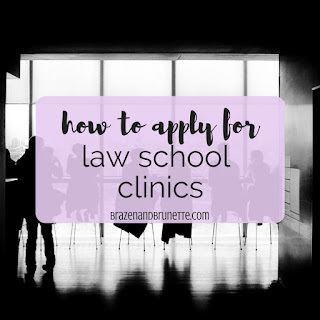 My school has six clinics— advanced alternative dispute resolution, civil practice, criminal defense, family law/housing, innocence project, and tax. Since I want to do civil law, I applied to the ADR and civil practice clinics. The application had us rank our priorities and list relevant classes that we've taken/were currently in. I had to describe my past legal experience so I just put my internships from my 1L summer. It also asked to describe any pro bono experience and I can't stress to y'all enough that getting a lot of pro bono hours will always come in handy! I ranked the ADR clinic first and the CP clinic second. This was because the ADR clinic was only one semester long and the CP clinic was a year long. While the year-long clinic would obviously give me more experience and I think I'd even get to get my student bar card for participating in it, the shorter clinic was actually perfect for me because I was really hoping to get into another program in the Spring and wanted the chance to be a part of both. And I'm very happy to say that I got in to my first choice! So there's litigation, negotiation, arbitration, and mediation. Lots of shuns haha. Litigation is where you go to trial and argue a case in front of a jury or a judge (called a bench trial). Litigation is the most commonly known type of lawyering but it's actually not the most popular. This is because the court system is set up to have parties work it out on their own and only go to trial kinda as a last resort. If you're interested in this, see if your school participates in mock trial competitions and try to get involved. Negotiation is where the two lawyers (and maybe their clients) meet up and work things out on their own. I took a negotiations class because I was behind on my "legal practice" hours after transferring but it has so far been the most useful class I've taken and I really encourage everyone to look in to it! If you're interested in this, see if your school participates in negotiation competitions and try to get involved. Arbitration is kinda a step down from litigation. There's two sides who argue in front of a third party, so I think of it like basketball with two teams and a ref. The rules aren't exactly the same as trial but the process is pretty similar, and if it's "binding arbitration" then what the ref decides is just like if a judge decided it (usually arbitrators are retired judges). If you're interested in this, see if your school participates in arbitration competitions and try to get involved. Mediation is kinda halfway between negotiation and arbitration. There's a third party just like arbitration, but they're not the judge. Instead, they just kinda help the two parties negotiate. For example, mediators usually start by talking to each side separately to help them decide what they actually want to happen and help them keep realistic goals. Mediators also usually will suggest ideas that will help both parties. One thing that I'm excited about mediation is that it's real heavy on conflict-resolution and since I'm looking at doing in-house counsel, I see that as being something really useful to be good at and come in with experience. Another reason why I'm excited is that after this class, I'll be mediator certified. One of my friends took this class Fall her 2L year and then started doing mediations on the side Spring her 2L year and if I remember right she was getting paid like $25 an hour! And I'm pretty sure it's like $50-100 an hour once you have your JD or something like that (I know it increases, but idk what the requirements are) and so this would be a great side-gig to do if I ever want to cut down on my workload to have kids or when I retire. And small world- the place I'll be doing my mediation through is actually where I'm working right now! Before I was hired, I had to talk to my boss and my professor to make sure that they were both okay with it. To prevent conflicts of interest, I'll just be working on city issues for my job and then I'll only be dealing with county issues for my class. My boss is also making sure that he doesn't assign me to anything that would give me a head start from my classmates and has reassured my professor that he won't play favorites with me just because he knows me.